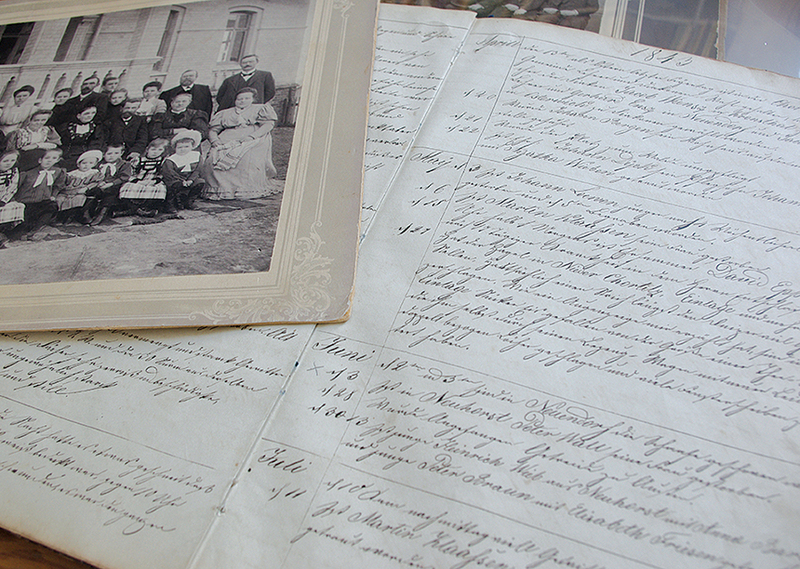 A group photo and journal from the Mennonite Heritage Archives. “This is our collective memory,” says Conrad Stoesz, gesturing to a long hallway filled with row upon row of shelves, packed with files and boxes. Stoesz is the archivist at the Mennonite Heritage Archives (MHA), located on the campus of Canadian Mennonite University (CMU) in Winnipeg. The “collective memory” stored in this archive is made up of cassette tapes, film reels, diaries, letters, blueprints and photographs, among many other historical documents. 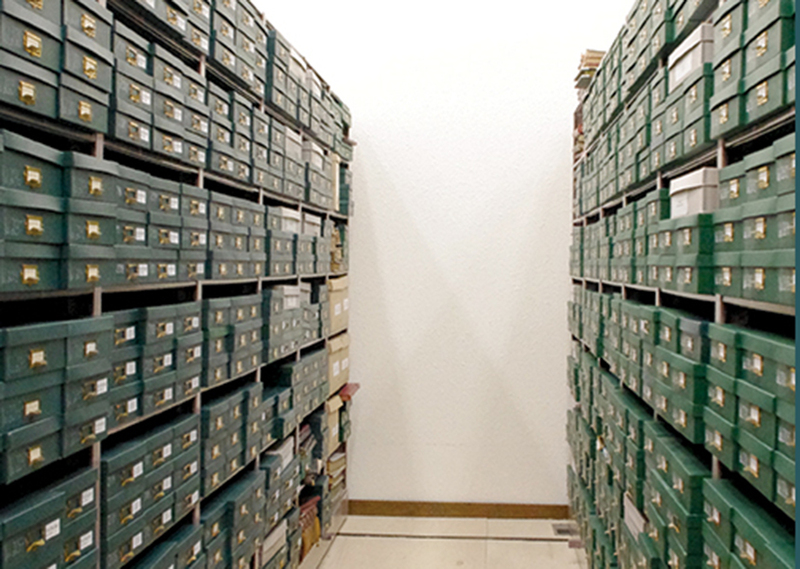 The MHA contains 600 linear metres of textual records, 5,000 audio recordings and 33,000 photos. Archives hold an incredible amount of history, yet the younger generations of today don’t seem to care. On any given day, it’s mostly older people you’ll find in the MHA. Andrew Brown, 24, says he is by far the youngest person in his archival circles. He graduated from CMU in 2016 with a double major in history and political studies. He began working for the Centre for Mennonite Brethren Studies Archive this past summer and was recently invited to join the Manitoba Mennonite Historical Society. “I think I might be the youngest person to ever join,” he jokes. 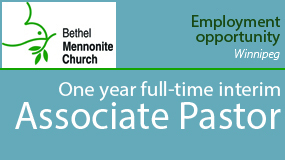 Archives also keep the current Mennonite community connected. Mennonite Archival Image Database (MAID) is a project created by seven archives to manage their photos and make them accessible to the public. Shortly after its creation, MAID began publishing pieces in Canadian Mennonite as a promotion. Titled “A moment from yesterday,” each clip features a photo from the archives and a short caption. Occasionally, the archives don’t have complete information about the photo and have reached out to readers to solve the mystery. Most notably was the publication of a photo of five nurses who graduated in 1948 from the University of Alberta, but their first names were missing. Several readers wrote in and identified the women in the photo. “I think that there is still a cohesiveness in our Mennonite communities that remembers people, that remembers events . . . this web that can be tapped, that has a lot of knowledge,” says Stoesz. Archival work is very detailed and can’t be done with the simple push of a button, he says, noting that he and MHA administrative assistant Connie Wiebe respond to 140 requests for information each month. He says it’s been affirming to hear good responses to the “A moment from yesterday” photographs. People tell him that those clips are the first thing they look for when they read the magazine. He hopes that these photos will continue to generate interest for archives and an understanding of their importance. “If we were to lose that, or keep cutting funding to this cloud of witnesses, I think we’d lose something special and a voice of our ancestors,” says Brown. 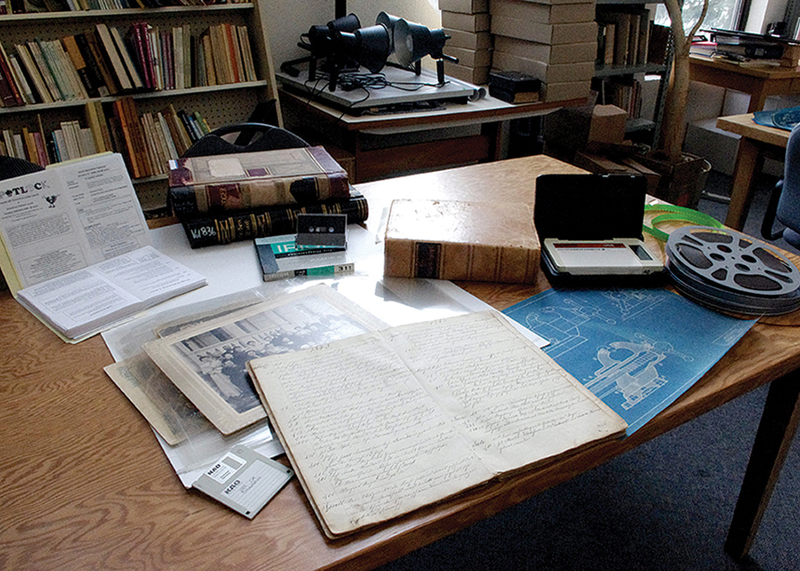 A variety of archival materials from the Mennonite Heritage Archives, such as a photograph, blueprints, books and a film reel. 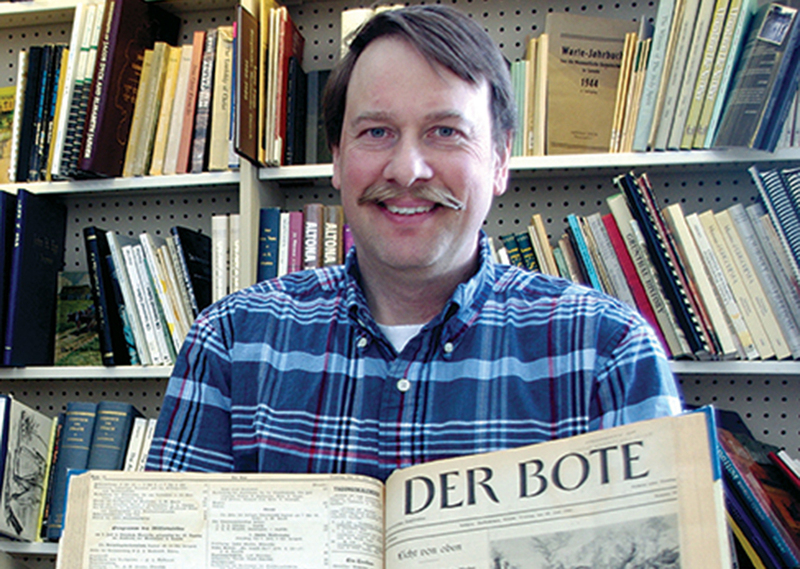 Conrad Stoesz, archivist at the Mennonite Heritage Archives, holds an old newspaper. Files upon files in the back room of the Mennonite Heritage Archives. 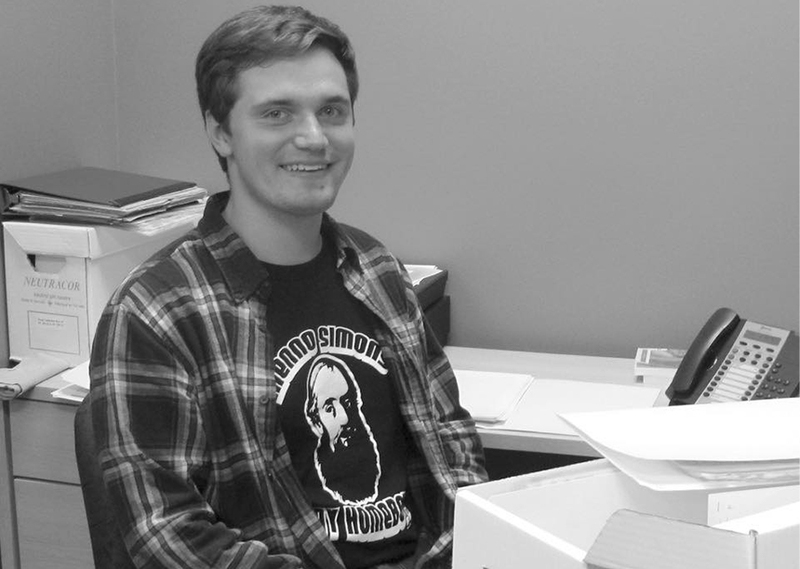 Conrad Stoesz, archivist, working at the Mennonite Heritage Archives.